A woman captured on video squashing herself onto a very, very packed subway train appears to have hit a uniquely-New York nerve. 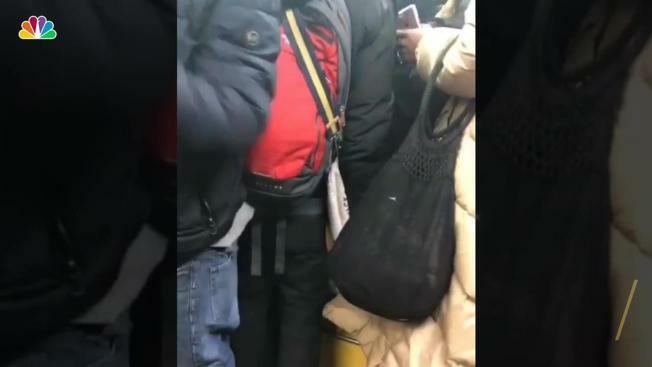 The video, taken by Instagram user @tedeskk at Union Square around 7.30 p.m. earlier this week, shows the train doors failing to shut over an already sardine-level carriage, as people's bags and personal items spill out in the squish. The corner of just one bag is all that's holding up the evening commute. But just as you think everyone has held their breaths just enough for the doors to shut, a woman wearing a large puffer jacket takes the opportunity to pop in, too, squashing her body on top of the others. The clip was shared to the popular Subway Creatures account, where it received hundreds of comments. "That bag won’t even fit ... where does that last person think they’re going," one user commented, incredulous. "Q: how many people can fit in an NYC subway car? A: one more," another said. Many just vented their frustration in words that cannot be repeated in this article. The basic sentiment? "This was stressful to watch." As stressful as it is, the video has garnered more than 200,000 views on the Instagram page. And some New Yorkers even admit, it's a problem they love to hate. In this woman's defense, the train doors do manage to shut in the end. Perhaps there was space in the middle?